I mentioned in the last post, the one with the late Christmas card, that I've been creating more than I've been posting. Which is good - I have a bunch of cards stocked up now, so I don't feel pressured or the need to scramble when something comes up. But it's also bad - I haven't been sharing with you all and I miss that. I love reading all your comments! I never thought it would be so hard to be a full-time Mom with three kids, have a full-time job and do everything else that is expected of us adults. Lemme tell y'all, I don't remember it being this hard, before. But then I only had one kid and it was just me and her. There are so many more people in the house now that finding even a few extra minutes is tough. The older two are great and pretty self-sufficient now (for the most part), the little one *thinks* she can do it all on her own .... but not so much. Anyway, today I wanted to share this super fun birthday card featuring Lawn Fawn's "Coaster Critters" stamp set. I'll be honest, this one didn't really strike my fancy when it came out. In fact, it took a little while for me to warm up to this set. Don't get me wrong, it's super cute, I just didn't know what to do with it. It seemed to me that this was a one and done sort of set. How many roller-coaster cards can a person make? Luckily, I'm a huge fan of mixing and matching sets and none do it better than Lawn Fawn. I used Tumbled Glass and Cracked Pistachio Distress inks to create my sky and grass, adding a bit of Bundled Sage to the very bottom. I removed all the masks (which I save with the stamps to use again - literally until they fall apart or the ink starts to seep through) and coloured all the images with Copic markers. I really wanted to keep this one in primaries. I added some detail with my white gel pen, then stamped my greeting with the same Memento Ink. To finish off the card I used clear Wink of Stella on the balloons, all the metal of the coaster cars and rails as well as the top of the stand. I hope you like today's card and are inspired to create something of your own. If you haven't already, please follow me on the right side bar, over on Facebook and on YouTube! Drop me a line in the comments section below and let me know what you think! I cannot tell you how much each of your "likes", comments, subscribes and "thumbs up" means to me. super cute and fun scene! that set is so cool and those tiny crtters.. awww they're adorable!! 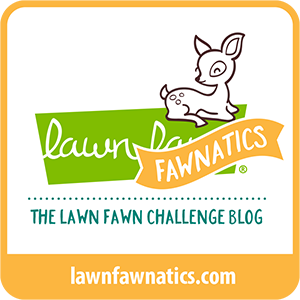 Thank u so much for playing with us at Lawn Fawnatics!